We don’t have summer-sweet tomatoes yet but I did get my hands on the first local batch I could find. Then I slow roasted them with garlic, onions and herbs for about 45 minutes on 325F and boy were they sweet and juicy. 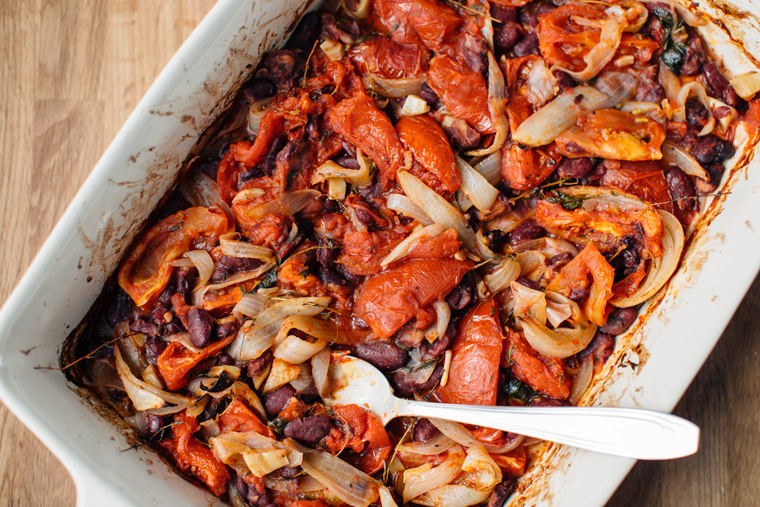 Don’t be fooled by all the fanciness – this dish is so low maintenance and practically cooks itself. Because who really wants to be stuck in the kitchen on a pretty spring day?! Go outside and play! The collard greens grew in my porch pots. I neglected them all winter – didn’t water them once and now they are begging to be eaten. 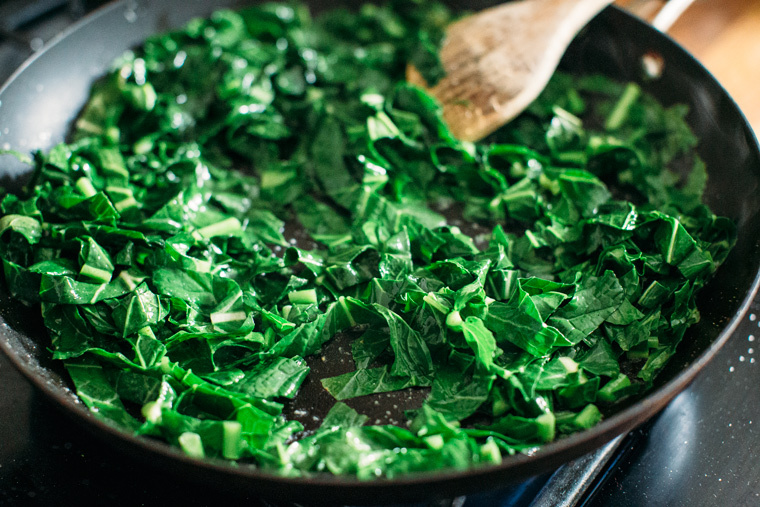 Collards are good, even better when cooked in butter and vinegar. And if you were ever bashful about butter – don’t be! It makes everything better. Cut up tomatoes, onion and garlic. Place in oven-proof dish with olive oil, salt & pepper and roughly chopped herbs. Place in pre-heated oven at 325F for 45 minutes. If you like it more saucy, cover with foil. If you prefer more chunky and roasty, leave it uncovered. Cut collards into thin ribbons. Place butter in a hot pan, let it get bubbly. Add the collard ribbons and sauté for a minute before adding the vinegar. Cut up tomatoes, onion and garlic. 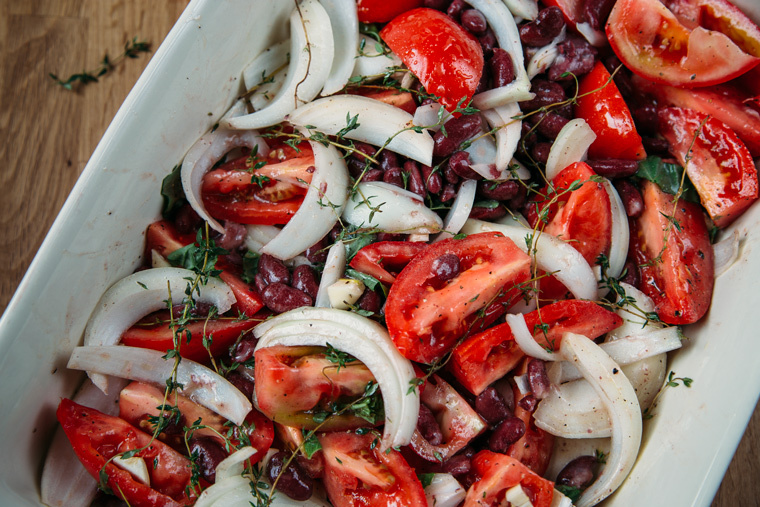 Place in oven-proof dish with olive oil, salt & pepper and roughly chopped herbs. Place in pre-heated oven at 325F for 45 minutes. If you like it more saucy, cover with foil. If you prefer more chunky and roasty, leave it uncovered. 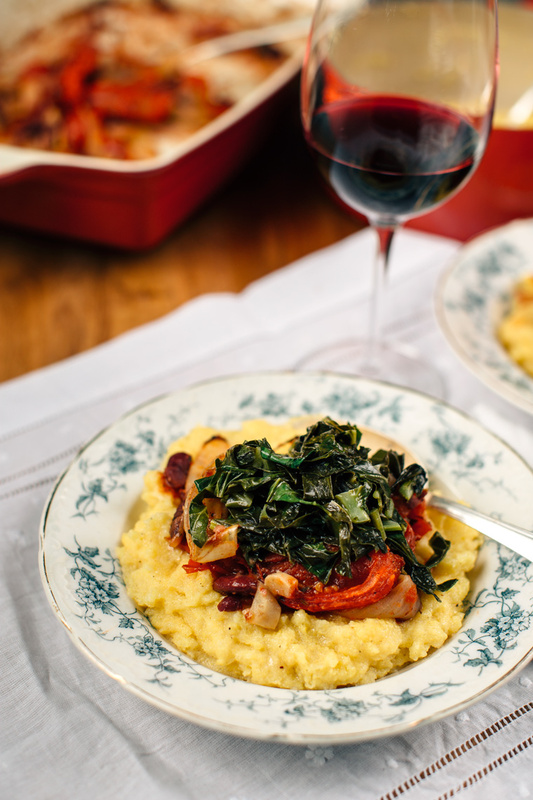 I used quick-cooking polenta that only needed 5 minutes to cook. If you are using the real stuff start cooking the polenta at the same time as the tomatoes. 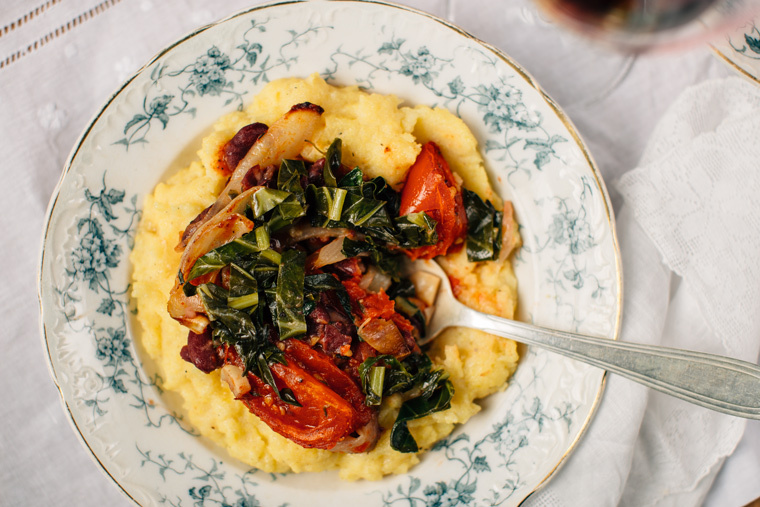 More tips on cooking polenta here. 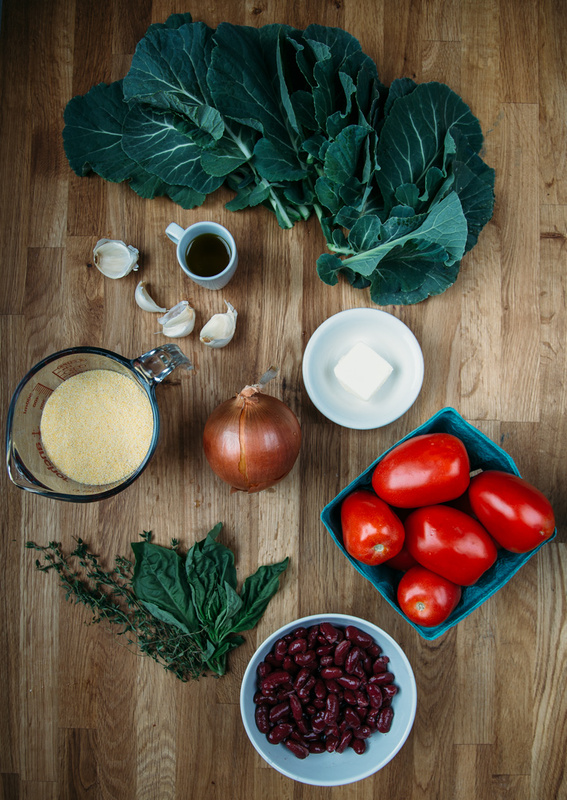 I just added a drizzle of olive oil, salt and pepper to my polenta – it was creamy and delicious. Prepare the collards when the tomatoes are just about done cooking. Cut collards into thin ribbons (stack the leaves on top of one another, fold lengthwise, cut into thin ribbons). Place butter in a hot pan, let it get bubbly. Add the collard ribbons and sauté for a minute before adding the vinegar. Cook for a couple more minutes and done. Oh my – this sounds amazing. I can’t wait to start seeing tomatoes pop up in my area and using greens from my garden! This post makes me so eager for summer!! Thank you Shelly and yay for summer fruits and veggies! Hi Grace, what beautiful pics! 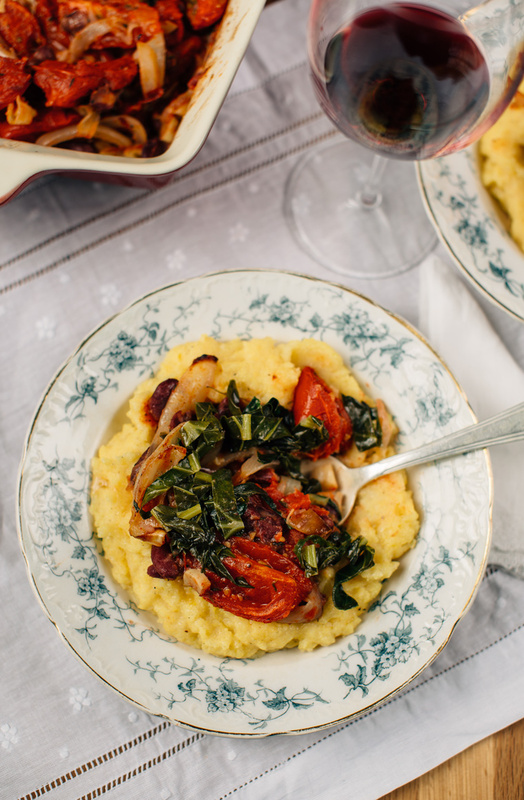 love this combination of ingredients, just discovered polenta and were loving it. Thanks Cheri! I recently discovered it too and I love it! Lovely recipe lady! We’ve been eating a lot of polenta recently too. I love the slow roasted tomatoes!